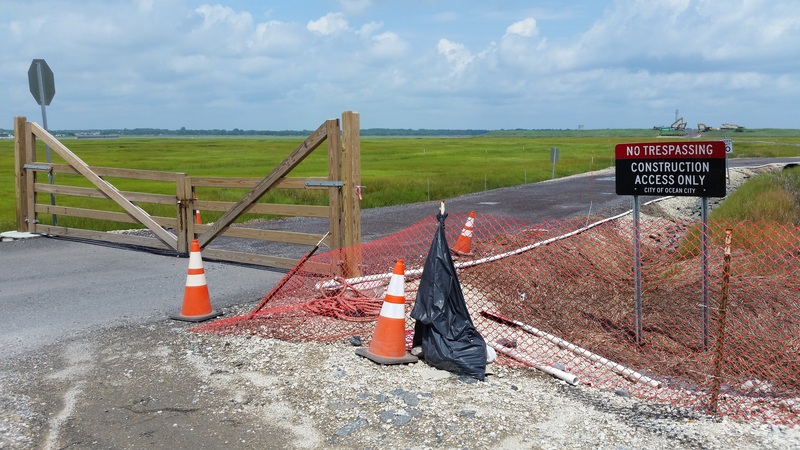 Site 83, a disposal facility in the marshlands, has been emptied out to make room for more dredge spoils as the city moves ahead with plans to deepen the shallow back bays. In a major development that will boost its $20 million dredging program, Ocean City has finally emptied out a disposal site where it has been taking muddy sediment removed from its shallow back bays for decades, representatives of a consulting firm told local residents during a town meeting Saturday organized by Councilman Bob Barr. Site 83, as it is known, had to be cleaned out before the city could move ahead with the next phase of the dredging program to deepen silt-choked lagoons and channels from one end of the barrier island to the other. 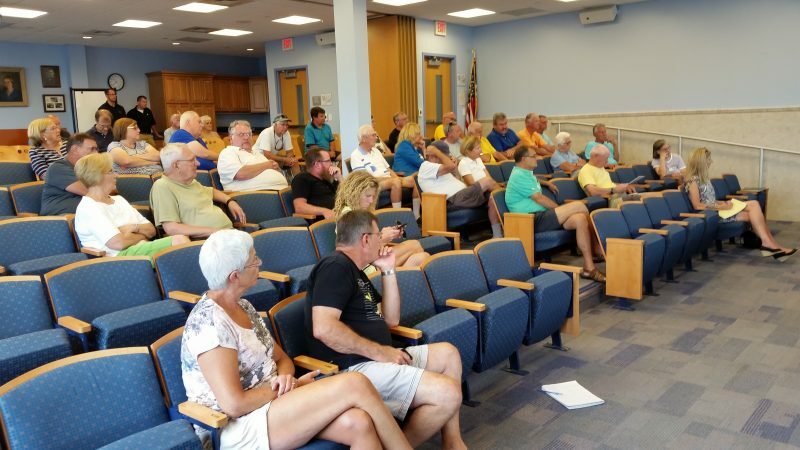 “Without that facility, you cannot do dredging in Ocean City,” Carol Beske, an executive with the city’s dredging consultant, ACT Engineers Inc., told the approximately 50 residents who attended the meeting at the public library. Site 83, located in the marshlands off Roosevelt Boulevard in the south end of town, has a capacity of about 300,000 cubic yards of dredge spoils. It has served as the city’s dredge disposal site since the 1970s or 1960s, Beske noted. However, the site had to be emptied out before it begins accepting new sediment from the next round of dredging projects scheduled in the fall. Now that Site 83 has been cleaned out, the convoys of noisy trucks that had been hauling the dredge spoils out of the facility have stopped. Up to 100 trucks per day had been pulling in and out of the site, kicking up dust and dirt in the process and making it unpleasant for the surrounding neighborhoods, officials said. From left, Carol Beske, of the consulting firm ACT Engineers Inc., and Councilmen Keith Hartzell and Bob Barr address the audience at Saturday’s town meeting. One resident who spoke during the town meeting, Dave Bereeden, of Victoria Lane in the Merion Park section, said the lack of truck traffic will be a relief to the neighborhoods next to the Roosevelt Boulevard corridor. “It’s nice not having 100 trucks on that road every day,” said Bereeden, who credited the city with doing a good job of overseeing the project and securing the permits. Bereeden suggested that the city should take this opportunity to beautify the Roosevelt Boulevard corridor, making it a more inviting gateway for the tourists who vacation in the beach town. “Curb appeal is very important for a tourist community,” said Bereeden, who formerly served as the city’s Public Works manager and was also an official in the business administrator’s office. Beske said the entryway to Site 83 off Roosevelt Boulevard will be landscaped to make it more aesthetically pleasing. Among other improvements, an orange mesh construction fence will be removed and replaced with something more attractive, she added. The city, meanwhile, is preparing to resume its dredging program in September. Environmental permits are already in place for dredging of Carnival Bayou, between 16th and 17th streets, South Harbor, between Tennessee Avenue and Spruce Road, and Sunny Harbor, between Arkansas Avenue and Walnut Road. Last December, the city applied for a permit from the New Jersey Department of Environmental Protection and U.S. Army Corps of Engineers to conduct dredging along the entire length of the island. Beske said the city expects to receive word by year’s end whether the permit has been approved. Among other things, the permit application seeks permission to convert what is now a temporary access road serving Site 83 into a permanent one. 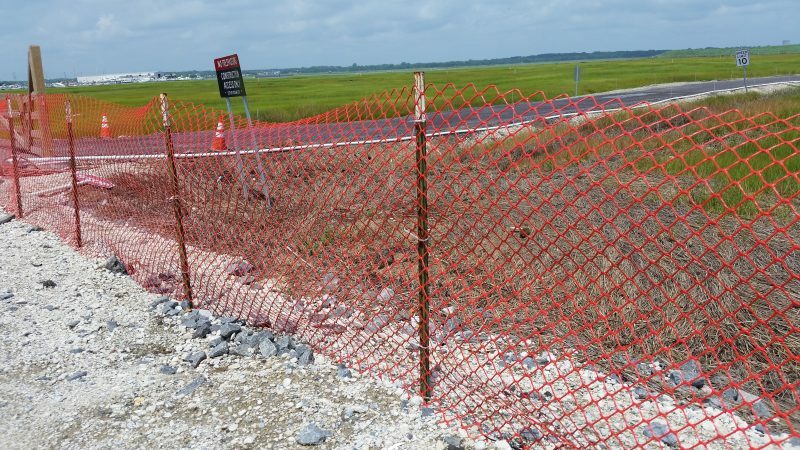 Landscaping improvements planned for the entryway of Site 83 off Roosevelt Boulevard include removing an unsightly orange mesh construction fence. Having a permanent road would speed up the process of having trucks haul away the dredge spoils pumped to Site 83 through pipes. However, in the future there would only be a need to run trucks to the site perhaps two months during the year, most likely January and February, during the city’s quiet off-season, officials said. The soup-like sediment must be “de-watered” before it can be removed from the disposal site. The water makes the dredge spoils too gooey and heavy to haul away, so the muck must stay at the site until it essentially dries out. Councilman Barr, who represents the Fourth Ward neighborhoods that surround Site 83, stressed during Saturday’s meeting that Ocean City will not accept dredge spoils from other towns now that the disposal facility has been emptied out. It will be used exclusively for Ocean City’s dredging projects, he said. Barr, who was joined by four other Council members at the town meeting, called dredging the “most challenging issue” the city has dealt with for a number of years. On and off, the city has been confronted with legal fights, regulatory hurdles and the high costs of the dredging projects. “It’s been a really challenging issue for a lot of different reasons,” Barr said. Councilman Keith Hartzell said city officials have been frustrated by the regulatory restrictions and conflicts that have delayed the dredging program. 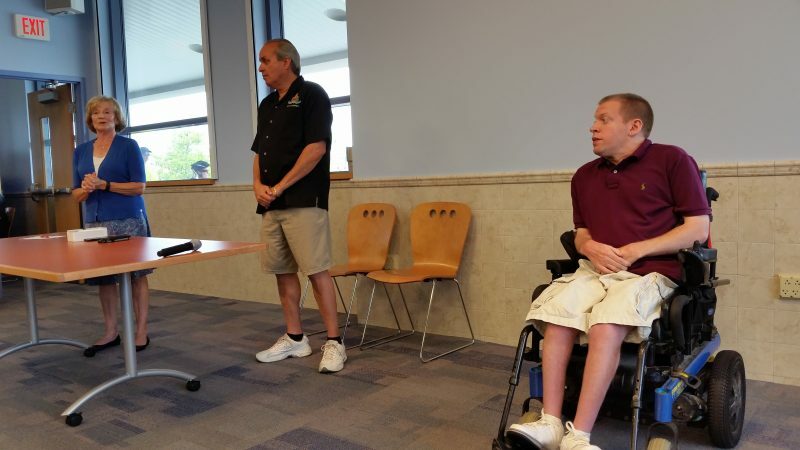 In some cases, one department within a regulatory agency will give Ocean City its approval, but another department of the same agency will object, Hartzell explained. “It’s frustrating for us and at times it’s going to be frustrating for you folks,” Hartzell told the audience at the meeting. Audience members listen to a presentation on the city’s $20 million dredging program during the town meeting at the public library. The city began the first round of dredging last year as part of a $20 million program proposed by Mayor Jay Gillian for 2016, 2017 and 2018. In 2017, the municipality plans to spend $7.5 million for dredging projects, said Frank Donato, the city’s chief financial officer. Some of the silt-clogged lagoons are so shallow that boat owners are trapped at their slips or must wait until high tide to gain access to the water. The city’s marinas are also threatened by the thick sediment. Hartzell said there are “many, many people” who simply can’t use the back bays because of the silting problem. To deepen the lagoons, the city is planning a comprehensive dredging program that would span the island from “tip to tip.” An estimated 1 million cubic yards of sediment must be cleared out of the lagoons and channels, enough muck to fill about 15 football stadiums. Eric Migala, another resident who spoke during Saturday’s meeting, said the shallow lagoons are preventing residents from enjoying their boats and bayfront homes. He said his boat remains stuck in mud. Migala, who lives on Waterway Road, urged city officials to begin dredging work on the adjacent channel as soon as possible to clear it out for boat traffic. The Waterway Road channel is not yet on the list of dredging projects, but city officials assured Migala they are aware of the problem and hope to address it. In a related issue, Migala objected to plans for disposing of dredge spoils at Site 83, arguing that the spill pipe used for the project will threaten the Waterway Road channel. “Site 83 is being overworked and is putting spillage into a natural waterway. I care about the well-being of a channel that is being destroyed,” Migala said in an interview after the meeting.